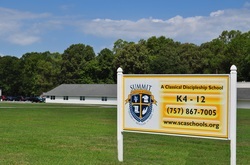 Summit Christian Academy (SCA) is a K-4 through 12 classical Christian school designed to partner with parents of like values to develop lifelong learners who are carefully equipped to meet the educational, professional, moral and spiritual challenges that we all face throughout adulthood. 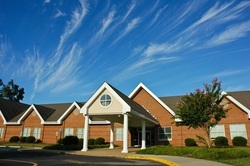 The Summit motto, “Discern, Articulate, Serve” represents the core values that SCA holds dear. We pursue these values by instilling a clear and accurate understanding of truth and inspiring the desire to pursue it vigorously and articulate its beauty to this world as competent, humble, and gentle servants of the Lord Jesus Christ. An abiding love for truth is central to these goals. This love presupposes three important beliefs: there is truth, truth can be known or discerned, and there is great value in its possession. When present, these beliefs naturally ignite a desire to learn. When absent, a desire to learn gives way to apathy and boredom. Proverbs 2:4 admonishes us to seek knowledge, discernment, and understanding as if they were silver or hidden treasure. Learning to distinguish that which is real and genuine from that which is false and misleading is critical to one’s education and effectiveness in life. This differentiation is central to our instruction in all subject matter. We insure this preparation for life by teaching all of our subjects under the umbrella of a biblical worldview. Colossians 1:16 states, “For by Him [Jesus] all things were created, both in the heavens and on earth, the visible and invisible….” Approaching teaching and learning from this perspective allows us to solidly establish a student’s knowledge and understanding of reality upon the God who created it. Since its inception in 1996, SCA has been striving to accomplish these goals through the application of the classical Christian approach to education. This methodology provides us with a developmentally sensitive approach to learning that allows us to teach with the grain of a student’s natural God given inclinations.